DualMode allows you to combine a paint preset and an image processing effect into a new kind of paint preset. The image processing effect is interleaved into your live painting. This means the effect can run live while you are interactively painting. For example, if you used a feathering image processing effect in DualMode painting then the feathering effect would be dynamically running as you painted, so your paint would feather out over time as a stroke or series of paint strokes progressed over time. DualMode can be used to simulate natural media effects like painting on a wet surface. DualMode can also be used to create wild and amazing special effects, or used in the context of live visual performance. There are currently 3 different editable parameters associated with a DualMode Paint preset. These controls are available in the Editor palette when in DualMode Paint operation mode. A DualMode paint preset will also access the editable parameters associated with the current paint synthesizer preset as well as the parameters associated with the chosen Dual Op image processing effect. To edit those additional parameters you need to switch to the appropriate Editor control panels associated with those operation modes. You can use the cmnd 7 hot key menu command to automatically move between DualMode Paint and the 2 other operation modes associated with the current DualMode Paint preset. This feature can be used to adjust the individual DualMode components while DualMode is running. The Timing parameter specifies the interleave timing for the Dual Op image processing effect. This is the time period between applications of the live Dual Op effect. The Trigger parameter specifies when the live Dual Op image processing effect will be run. The different trigger options can dramatically change the way the DualMode Paint preset’s appearance and behavior. Some of the trigger options are associated with pen proximity. Pen proximity is associated with a Wacom pen and tablet. Proximity means that the pen is within sensing distance of the tablet, so the pen can be hovering above the tablet surface without touching and be in proximity (you can move the cursor when in proximity). Using the Pen Lift Proximity trigger option means that the paint stroke will draw normally and then when you lift the pen the dual op alone will then run in a loop until the pen is lifted out of proximity. 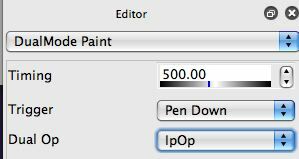 This option is useful for building paint presets that drip or simulate wet paper soak after a stroke is drawn. The Dual Op parameter lets you choose the image processing effect that is used in the DualMode Paint preset. You can choose between the current image operation, texture synthesizer, MSG, and interactive warp settings. When you save a DualMode Paint preset the parameters associated with your current Dual Op option along with the current paint synthesizer parameters are stored in the DualMode Paint preset. Opening a DualMode Paint preset will import those saved parameters into the appropriate DualOp and paint synthesizer control panels, overriding their current settings. DualMode Paint presets are great for simulating painting on wet surfaces. But they can also be used to create a wide variety of different kinds of paint or abstraction effects. They also give you the ability to encapsulate in a single paint preset behavior that would have required animating multiple iterations of a paint action sequence in previous versions of Studio Artist. Studio Artist includes a number of features for live video capture and processing. Live video frames can be captured from either a built in iSight camera or an external firewire or usb camera or webcam. You can setup Studio Artist so that a live video frame will be captured in the Source Area at the beginning of each DualMode paint cycle. By cycle we mean one cycle of painting and application of the Dual Op image processing effect. To capture a live video source frame for each DualMode Paint cycle you need to turn on the File : Source Settings : Live Video Loop Action Advance menu flag. And of course you need to make sure your camera is turned on if it’s an external camera, and that you aren’t currently using it in another application like iChat or Skype. Studio Artist includes a Movie Stream feature that is useful for streaming out a video file of Studio Artist processing. There are a number of different movie stream flags that can be set to determine when frames are automatically written into an open movie stream. The Enable Write on Op End movie stream flag shown below located in the File : Stream menu is a useful frame write option for recording an auto painting DualMode Paint preset into an open movie stream. Each cycle of the DualMode Paint processing will write a frame at the end of the processing cycle when using this movie stream option. This movie stream frame write option could also be used in conjunction with the live video capture option described above to configure a DualMode Paint preset to capture a video frame, process it, and then write the processed output for each cycle of the DualMode processing. Again a cycle consists of some painting followed by one application of the Dual Op image operation.